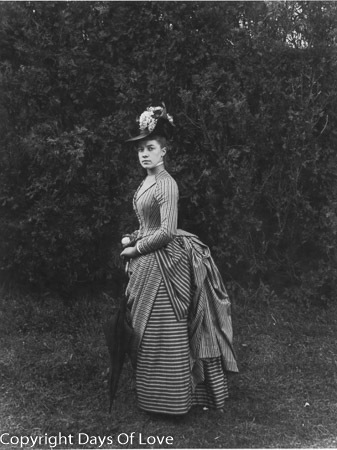 Elizabeth Alice Austen (March 17, 1866 – June 9, 1952) was a Staten Island photographer. Austen's father abandoned the family before she was born, and she was baptized under the name Elizabeth Alice Munn on May 23, 1866, in St. John's Church on Staten Island. She never used the name Munn and would initial her negatives with "EAA" for Elizabeth Alice Austen. With no household income and no husband, Alice's mother moved back to her own parent's home, which was known as Clear Comfort. Alice was the only child in the household, which now consisted of: Alice's mother, Alice Cornell Austen (1836-? ); Alice's maternal grandparents, John Haggerty Austen (c1800-?) and Elizabeth Alice Townsend (c1800-?). Also in the house were her mother's siblings: Peter Austen, who was a chemistry professor at Rutgers University; and Mary Austen (1840-?) aka Minnie Austen, who was married to Oswald Müller (1840-?) who was the owner of a shipping company. Oswald was born in Denmark. The house was built in the 17th century, but was expanded during the 19th century by Alice's grandparents: John Haggerty Austen; and Elizabeth Alice Townsend. Clear Comfort was dedicated as a National Historic Landmark on April 8, 1976, one month after the 110th anniversary of Alice's birth. It is also known as "Alice Austen House" and is located in the Rosebank neighborhood. Austen became interested in photography when her uncle, Oswald Müller, brought home a camera around 1876. Alice's uncle Peter Townsend Austen was a chemistry professor at Rutgers who taught her photographic processing. Peter and Oswald converted a closet on the second floor into Alice's darkroom. The earliest extant photograph by her is dated 1884. Over the next 40 years she produced around 8,000 photographs. By 1900 her uncle Oswald was the head of household and the family had two servants: Katherine Wertz (1857-? ); and Constance Rasmusth (1876-?). They also had a cook, Mary McDonald (1873-?). Austen lived off the interest from the money left by her grandfather but the principal was lost in the Wall Street Crash of 1929, and by age 63, she had no income. She began to sell off her silver, art works, and furniture to get enough money to buy food and fuel. She then took out a mortgage on the house which was taken by the bank in 1945. She sold her remaining possessions for $600 to a second-hand dealer from New Jersey and called her friend Loring McMillen from the Staten Island Historical Society to take the photos. He stored them at the Third County Courthouse in Richmondtown. She then moved to an apartment, then a nursing home. On June 24, 1950 she was declared a pauper and was admitted to New York City Farm Colony, Staten Island's poorhouse. In 1950 Picture Press started a project on the history of American women and contacted archives for unpublished images. C. Copes Brinley of the Staten Island Historical Society had 3,500 extant, uncatalogued Austen glass plate negatives of the roughly 8,000 she took. In October 1950, Constance Foulk Robert met with Brinley and McMillen to look at the negatives. Oliver Jensen came along on the next trip and he published several of the photos in his book Revolt of Women. He also wrote an eight-page story in Life magazine, and published six-pages of travel photos in Holiday magazine. The publications raised more than $4,000 for Austen and she was able to move out of the Farm Colony and into a private nursing home. On October 9, 1951 Austen was the guest of honor at the first Alice Austen Day. She said: "I am happy that what was once so much pleasure for me turns out now to be a pleasure for other people." 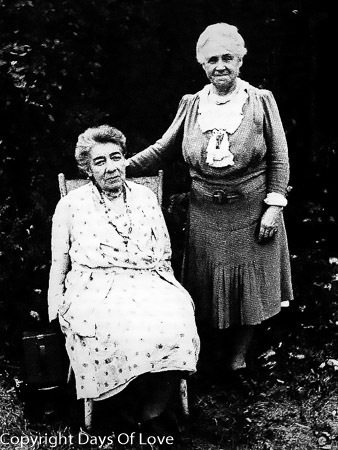 Austen continued to be supported by the Staten Island Historical Society and lived the next eight months in the nursing home, where she died on June 9, 1952. The Society arranged for her funeral and she was buried in the Austen family plot in the Moravian Cemetery at New Dorp, Staten Island. The Staten Island Historical Society at Historic Richmond claims they own over 7,000 original items (glass plate negatives, film base negatives, and original prints) by Austen.However, the society does not have the copyright. This collection is cataloged, digitized, and stored in an archival manner at Historic Richmond Town, and it is available for study by appointment. The Alice Austen House Museum also has a collection of photographs, with about 300 on display in the resource room, which is open to the public. "Her Life | Alice Austen House". aliceausten.org. Retrieved 2017-12-07. "Miss Alice Austen, 86 Photographer". New York Times. June 10, 1952. Retrieved 2008-06-26. Claire Wilson (March 12, 2006). "Rosebank, Staten Island: A Quiet Slice of New York Waterfront". New York Times. Retrieved 2008-06-26. "Alice Austen House". National Park Service. 2007-01-23. The queer encyclopedia of the visual arts. Summers, Claude J. San Francisco: Cleis Press. 2004. ISBN 1573441910. OCLC 54529572. "Alice Austen House Museum". Historic House Trust. Archived from the original on 2008-02-16. Retrieved 2008-08-05. Dejardin, Fiona. "Austin, Alice". Grove Art Online. Oxford Art Online. Oxford University Press. Retrieved 1 February 2014.
http://aliceausten.org/her-life/ Accessed 1 February 2014. "Old Friends Honor Miss Alice Austen. Photographer For 50 years Has Her Day". New York Times. October 8, 1951. Retrieved 2008-06-26. "Staten Island Historical Society Collections Database". IMLS Digital Collections and Content Project. Archived from the original on 17 February 2013. Retrieved 28 January 2013. "Archived copy". Archived from the original on 2011-07-27. Retrieved 2010-08-04.